A picture speaks a thousand words... 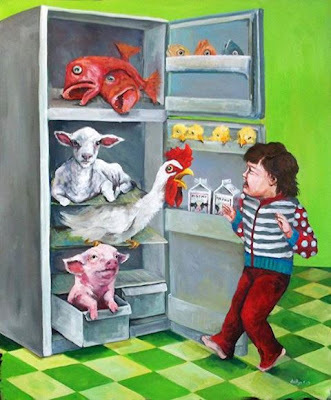 If all kids (and some adults) saw these animals in their fridge, and there were no parental pressure, you bet they will go veg. Nobody likes to see killing and dead bodies - it brings up a strange indescribable feeling in the heart... unless they have been conditioned and be really apart from their own natural heart. ... If people tell you plants feel pain, tell them to ask themselves deeply and use their heart. yet, i wonder if the post's illustration can revulse / sadden 1 - much less induce 1 to be a vegetarian / vegan. when i was young, i saw slaughtering / dead animals @ wet markets n elsewhere. i dun recall having been 2 psycho-emotionally affected then. i suspect i thought the sights n actions were reasonable; that to have cooked and maybe even flavourful food, killing or milking must have happened. of course, more crucially, i wasn't the person grasping, say, the chopper n the creature. i was adequately removed physically. as much as the animals' experiencing of pain, fear n stress might be a consideration for the abrogation of an abusive culture,the animals' rights and humans' moral meter must also figure or be articulated n analysed collectively n personally. every1 should be able to dictate 1's diet n his / her moral principles relevant to this matter. being attuned to the heart might not suffice. in relation to my above comments, i wonder if parents should provide a vegan diet for their newborn(s). a vegan diet might impose less blood n guilt on a mature n independent-thinking offspring(s) later. i didn't choose to be an omnivore. i was trained 2 be 1 n, i dare say, 2 love being 1. i decided 2 be a vegan - much 2 my mum's chagrin n others' bemusement / bewilderment. not every1 may be inspired or empowered enough 2 pick the drastic; restrictive; vegan lifestyle. Very nice post! I am a vegan too and find it difficult to keep vegan for more than a month due to my mum's stubborn prespective. She has skin that itches so much, she refuses to see that may be meat and corn are causing her to itch like mad. I became vegetarian at first. Then vegan for health reasons before being aware of 50% of animal cruelty that is supposedly hidden from humans because the news do not reach enough via mainstream media (who wants to sucy up to their meat industry advertisers). We like your posts very much! And will be sharing them on our site from time to time. Share us too on yours and let's create a better world together. No commission shall be collected by one agency from both vendor & purchaser in the same transaction without prior knowledge. This one is correct. You people can also take help from Acai Berry Juice to add healthy components to live healthy without any worries and tensions as it may help you to enhance your immunity and can help you to get normal blood and sugar levels. You can help slow down the speed of these numbers by adopting a vegan diet! Go veg today! Psyched about the Green and Healthy Festival at Singapore EXPO on Sunday! Dreamy has been a vegetarian since 26 Nov 2002. Vegan around 2 years later.